Good morning Friends! 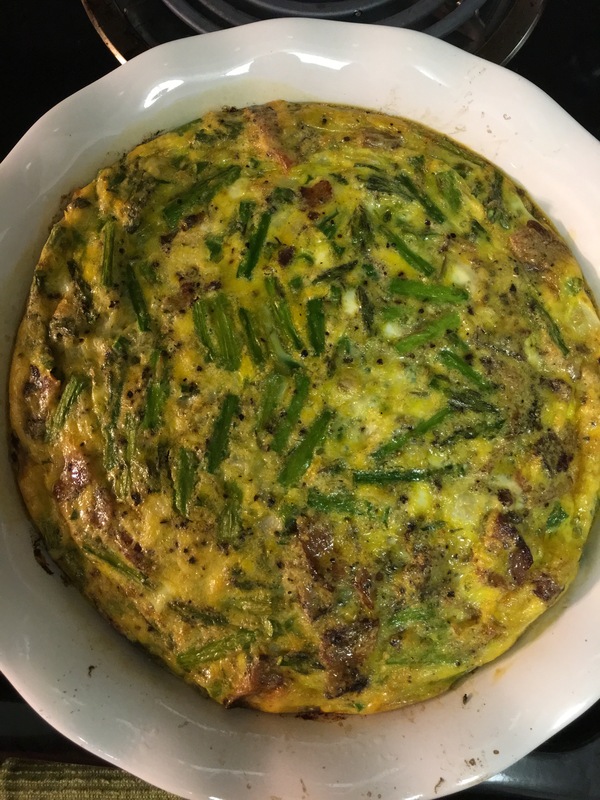 I’m going to share one of my favorite Frittata combinations for you that’s yummy and easy! What I love most about Frittata’s is you 1. Don’t have to be a super awesome cook to make these 2. The combinations are endless and 3. You have a healthy breakfast or protein pre-made for any time of the day! Also, you can incorporate so many veggies/proteins with yummy spices. This is also a great way to use some leftover veggies in your fridge that need to be cooked! I used a 9inch pie dish, but you could also do this in a cast iron skillet! I also normally add mushrooms to this combination, but I forgot to buy them so, here we are! Preheat your oven to 375 degrees Fahrenheit. Then melt the coconut oil in your dish coating the bottom. In a large skillet cook the chopped bacon for about 6-8 minutes on medium heat. Remove the bacon and allow to cool. In the same skillet, add the chopped asparagus and onions. Cook for about 3-4 minutes. You still want your asparagus to be crisp so don’t over cook them! Meanwhile, in a large mixing bowl, add your eggs, coconut milk, and garlic powder. Whisk together until it is all evenly mixed. Add the cooked chopped asparagus and bacon to the egg mixture and stir. Pour the egg mixture into your dish and then season with salt and pepper to taste! Cook in the oven for about 20-25 minutes or until the center is not runny anymore. Allow to cool for 5 minutes and then serve and enjoy! I dont know why I never thought to add asparagus! I love that idea!